Find Valentine crafts, Valentine's Day crafts for kids and homemade Valentine projects ideas here. Valentines Day gives you an opportunity to express the feelings of your heart to the person whom you love. In order to put across your thoughts, you would require a special gift on this special day, isn't it? If this gift is something, made by your own hands, then it will be certainly priceless and will touch the heart of your lover. Therefore, what you need to do is, just to devote a little time for making a wonderful gift, to make your beloved feel really special and important. 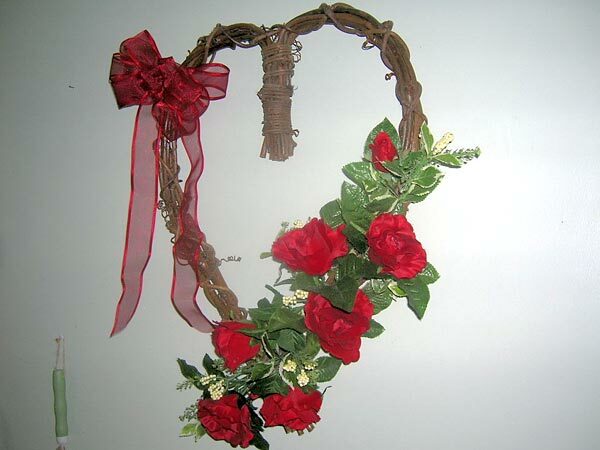 Romantic handmade Valentine's Day craft projects and ideas aim at making your beloved or simply a loved one happy. Kids can present bracelets to their friends, while teenaged girls can exchange duct tape purses and funky crocheted belts, which they have designed themselves, as the fashionable accessories. You may plan a romantic evening for your Valentine with canopy bed drape, valentine taper candles and cute looking edible penguins to look as love birds on your dinner table. Men can win hearts of their girls by gifting them a handmade convertible dress or a Valentine Day Gift Basket. In our related section, we have discussed about the various Valentine crafts, which may help you prepare lovely gift for the love of your life. When it comes to beaded lampshades, there are a lot of possibilities before you. You can use one of the many popular designs, like Victorian beaded lamp shades, beaded chandelier lamp shades and beaded lamp fringe, to decorate your room and make it look attractive. Believe it or not - women are never too young or too old to flaunt their jewelry. Right from kindergarten kids to young girls and old women, every female loves to adore herself with a piece of jewelry. Bracelets are one of the top picked options for females. While teenagers can make any kind of bracelets, for a kindergartner, the craft should be one that is extremely easy to make. A convertible dress is an amazing way to exhibit your talent and creativity. Gone are those days when you had to think about which dress to wear. Today, with the convertible dress, it is possible to make your presence felt, that too in several unique styles. This convertible dress is quite easy to make and requires basic sewing skills. In the present time, purse has ceased to be just a necessity, used by women for carrying various essential items, but also become a popular accessory, which females love to flaunt. The fashion buffs are especially keen about carrying different types of purses, matching their attire. Penguins are sweet, delightful as well as amusing and are liked by almost all the kids. So, when they are getting bored, why not entertain them with an easy penguin craft only. What about an edible penguin? Making this particular craft will comprise of a creative and fun activity, which the whole family can enjoy together and have fun with. The enduring aroma of flowers brings a gentle smile on the lips of almost everyone on this earth. Flowers are used on almost all the special occasion, for various reasons, right from presenting as a gift to forming a part of the overall decorations. However, one of the best uses of a flower bouquet is in the hands of a bride. Very much in vogue, belt not only serves as a functional item, but also as a fashion accessory. While a wide variety of belts are available in the market, the homemade ones can add to the personal touch, especially when you are planning to present something unique to your loved one. In case you are going to a party, but don't have the money to buy a gift, resorting to crafts is always the best option. One of the most inexpensive crafts comprises of a safety pin bracelet. Made mostly out of safety pins, it proves to be a very economical gift idea. Such bracelet is liked by kids, teen as well as ladies. It carries enough 'cool' quotient to please kids and teens and enough style to keep the ladies happy. Valentine's Day gives you the perfect opportunity to confess the inner feelings of your heart to the person you are in love with. Why not express your love on this special day with a special gift, something made by your own hands? It will certainly become priceless and will touch the heart of your lover. Valentine taper candles are the best options to show your love and creativity to your beloved, on the most romantic occasion of the year - Valentine's Day. The taper candles would surely set the mood for romance, on the day. They can make excellent gifts for Valentine's Day too. Moreover, they can also be used to set a romantic candle light dinner for your Valentine.